After declining sharply in 2012, initial public offerings could stage a turnround in the new year, say analysts, with China and Latin America leading the issuance. The number of global IPOs priced in 2012 year-to-date as of December 10 was down more than 40% from the same period a year earlier, while total proceeds raised were down by 27.4%, according to Renaissance Capital in Greenwich, Connecticut. YY, a Chinese social platform, raised $82 million by offering American depositary shares at the low end of the expected range in November. The Nasdaq-listed issue rose 8% on its first day of trading. YY was the first Chinese ADR since March 2012, when Vipshop went public. YY selected Deutsche Bank as depositary for the ADRs. Analysts at Renaissance Capital say the solid performances from YY and Vipshop could prove to be a strong indicator that investor confidence is gradually returning to Chinese IPOs. 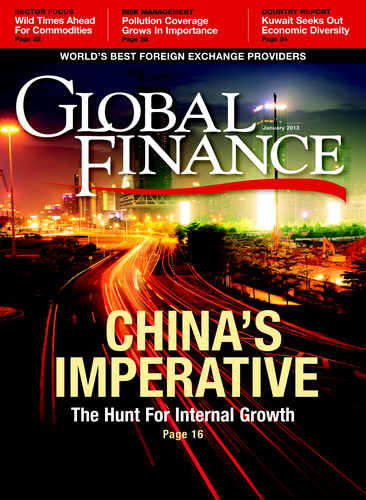 Insufficient financial controls and disclosures caused IPOs of China-based companies to fall out of favor in recent years. In 2010 a record number of Chinese companies sought listings in the US. A survey by J.P. Morgan’s depositary receipts business found that investors based in North America and Europe are confident about Latin American IPOs for 2013. Despite significant economic headwinds in Europe and China, Latin America offers steadfast domestic markets and attractively valued companies that demonstrate significant growth potential, the survey of 40 institutional investors found. 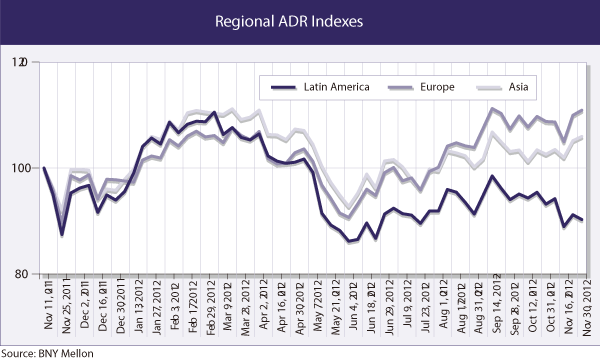 “The findings from this year’s survey may help Latin American issuers identify ways to improve their market valuations over time and to better compete for and attract capital needed to fund their growth,” says Candice Teruszkin, Latin American regional DR head of J.P. Morgan. A majority of the study’s participants said that consumer goods and services offer the most attractive investment alternatives, given Latin America’s growing middle class, rising income levels and low domestic unemployment. The two greatest challenges that companies based in Latin America face with respect to maintaining a fair market valuation are government intervention and trading liquidity, participants said. Shares in MegaFon, Russia’s second-largest mobile phone company, fell 2% in their market debut on November 28, after pricing at the bottom of their projected range. The company raised $1.7 billion in its IPO in London and Moscow. The offering was the largest listing by a Russian company since aluminum producer Rusal raised $2.2 billion in Hong Kong in 2010. The MegaFon shares were listed as global depositary receipts in London. MegaFon is controlled by Russian billionaire Alisher Usmanov, who holds a 30% stake in the UK’s Arsenal soccer club. Morgan Stanley and Sberbank managed MegaFon’s IPO, with assistance from Credit Suisse, Citi and VTB Capital. In October 2012, Telefónica Deutschland Holding, the German unit of Spain’s largest phone company, rose 3.6% in its trading debut in Frankfurt. The company raised $1.9 billion in Europe’s largest IPO of 2012. In other DR news, France-based Faurecia, the world’s sixth-largest automotive equipment supplier, selected Citi as depositary for its sponsored Level 1 ADR program. The ADRs trade in the US over-the-counter market. Faurecia’s ordinary shares trade on NYSE Euro-next Paris.